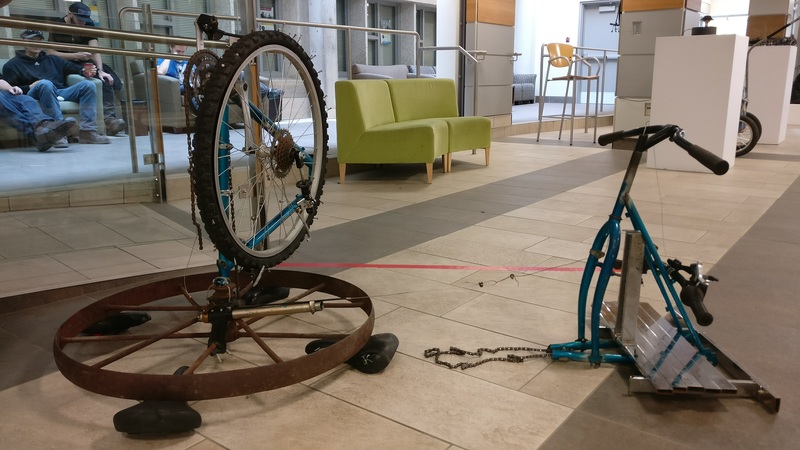 ART*Cycled is a reclaimed and upcycled art installation that premiered for the first time in October, 2016 during Campus Sustainability Week. 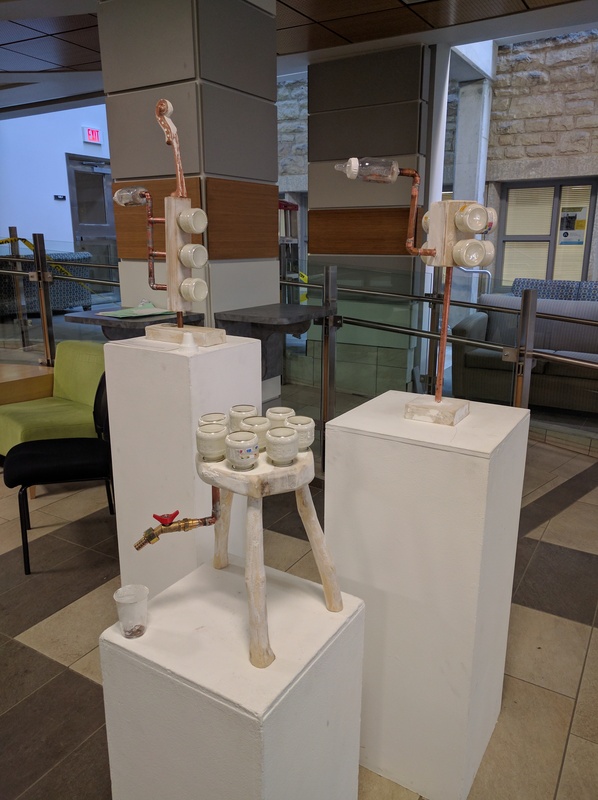 Through a partnership with the Office of Sustainability, U of S art students were able to save university-owned surplus assets from the landfill by turning them into throughtful pieces of sustainable art. The success of ART*Cycled 2016 has ensured that it will return to campus in 2017. 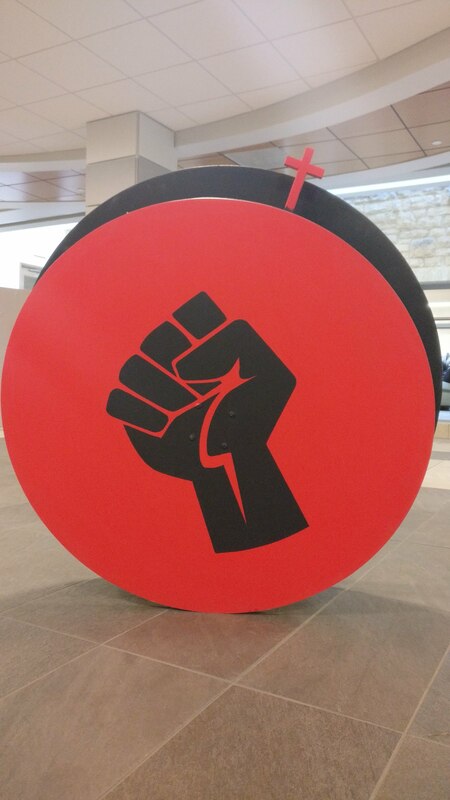 Interested art students should contact the office at sustainable.engagement@usask.ca for more information. 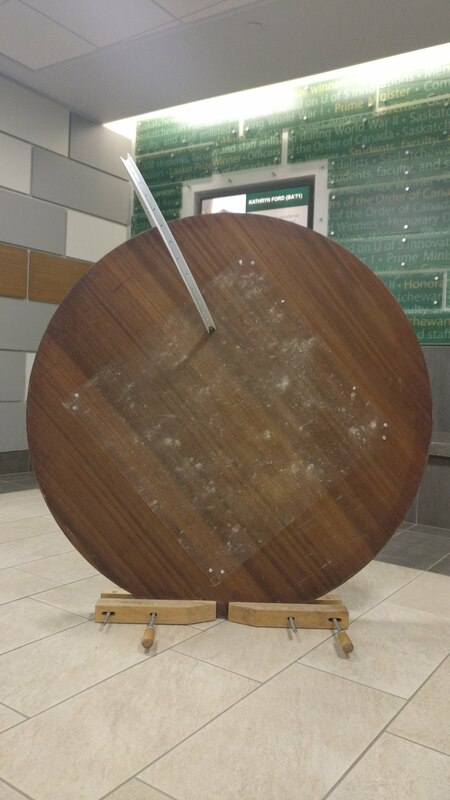 The inspiration for my sculpture is a found table which was to be discarded here on campus. 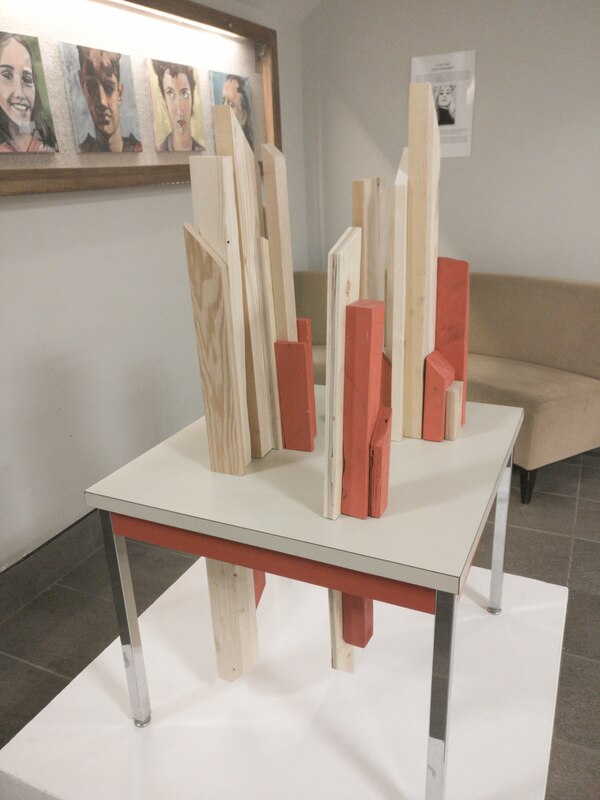 The transformation from a functional piece of furniture to a sculpture happened when I attached scraps of wood, of various lengths and widths, to the table top and bottom. I used mistint paint from a local store to colour a few pieces of the reused wood and match the existing pink trim on the table. The concepts I was exploring were how shape and colour can disrupt form and scale. Even though this is still somewhat recognizable as a table, it is no longer functional. Is it now an imaginary city-scape? The placement of the pieces of wood underneath the table poses a further playful question: is the wood bisecting through the surface, and why? The two big wooden circles and electrical gadgetry just made me feel like there should be some fun here! 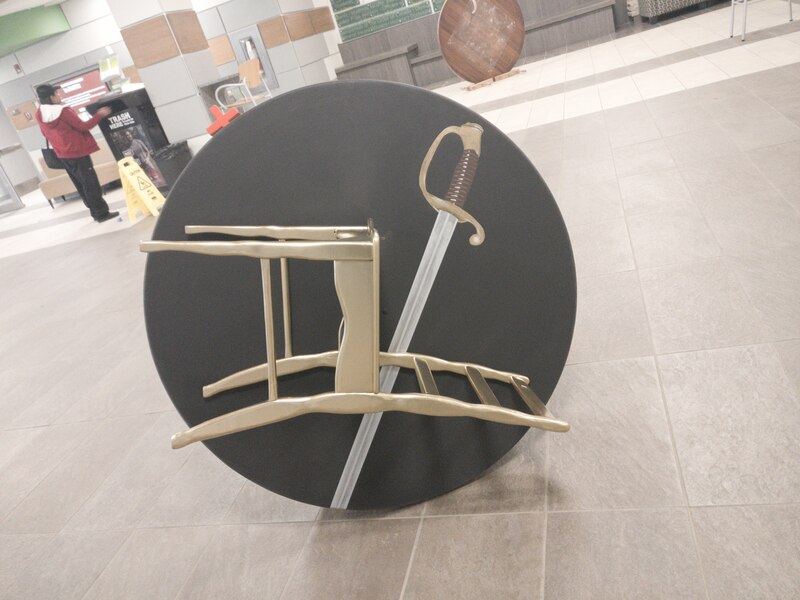 After juggling several ideas and making some false starts, I settled on a classy, gold chair in a vulnerable situation -- being turned around and upside down -- mixed with some historic symbolism. 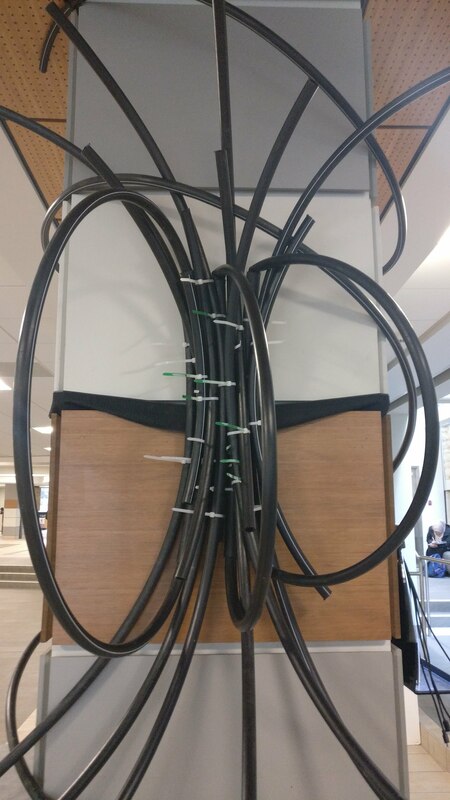 The inspiration for my sculpture was the found black poly-tubing hose that I transformed by cutting in various lengths and securing randomly to each other with plastic zip-tie attachments. Joined and arranged this way, the tubing was reminiscent of plants and their stem and root systems, and their relentless growth, even in industrialized environments. Equilibrium among plants and their environments results from continuous interaction and interdependence. Nature's need is to keep growing; it will push upwards and demand to be tended, even overpowering that which is manufactured and artificial. 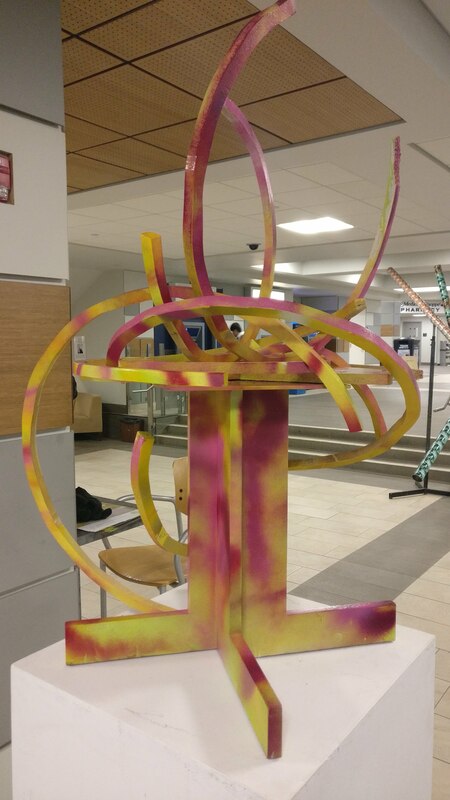 The inspirations for my sculpture were the found room divider, lamp and chair, from the campus disposal bins. I transformed these by adding details to the surface with various upholstery pins and office tacks; these became like drawings and transformed the mundane and familiar objects into something new. The idea that emerged from my exploration was how the careful adornment of everyday objects can change my relationship with them. They are no longer neutral as I have developed a connection through my labour and the tacks are the trace of this gain. Over the past six years and three changes of address, I've accumulated a wealth of plastic products. I harvested plastic shopping bags from convenience and grocery stores in my various neighborhoods and bubble wrap from moving home. These manufactured materials, which once contained sustenance or safely cradled my possessions, were repurposed to create a new structure that resembles an animal's nest through crochet and weaving techniques. 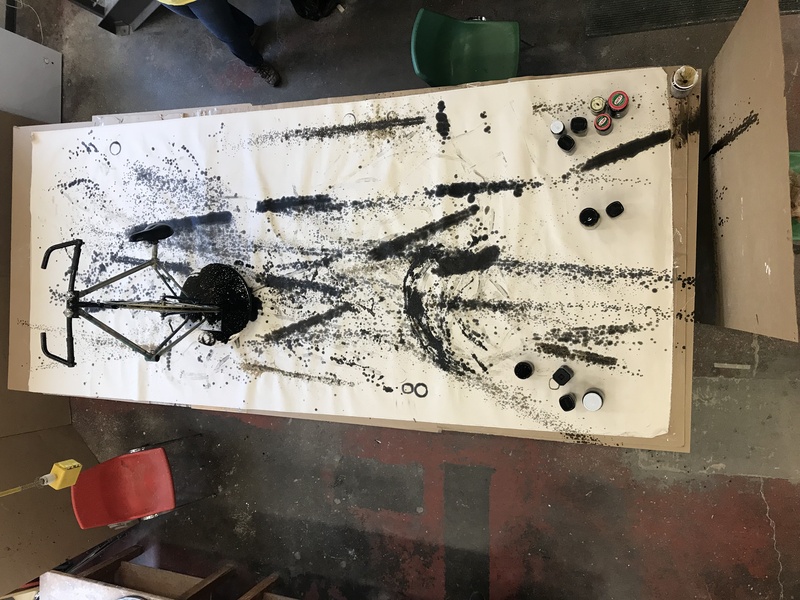 This work investigates conversations produced by the encounter of similar found objects of different natures: a round table top and a bicycle rim. My interest in these objects sparked from their likenesses, the signs of their previous use and their disconnection from the original desire that gave them a purpose. I concentrated on the found marks and shapes on the surfaces of the tabletop and the simplicity and emptiness of the bicycle rim – I imagine the vanished people and voices in those conversations and the speed of a wheel with the inertia on its rim. By intersecting the objects, changing their positions and responding to existing holes and marks, I revealed existing shapes on the surface of the wood, creating new drawings that relate to concepts of space and gravity, time and ephemerality. Through this work, I look for possible new meanings and readings of the forgotten objects in a space of possibility. I made clay pottery to hold my found objects on display. I initially intended to evoke a sense of transformation or renewal but the two mediums seem dissonant and out of place with each other. 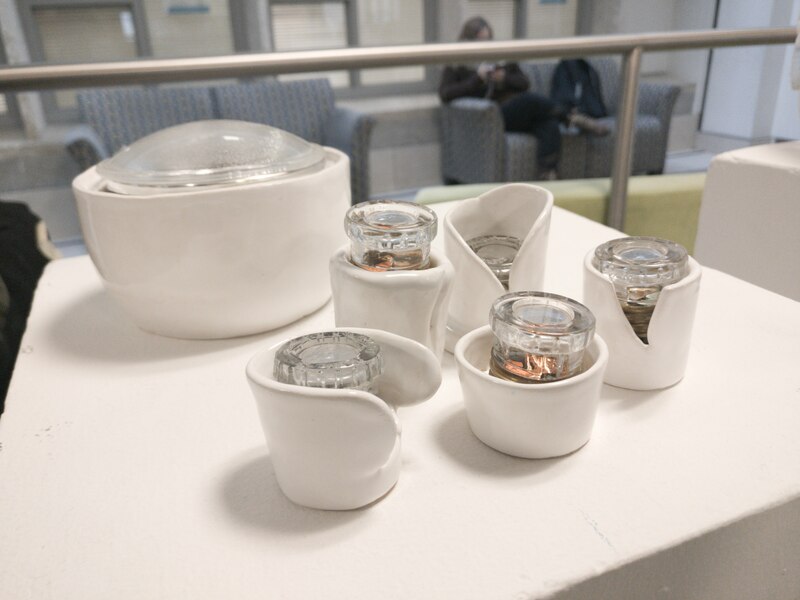 Even though the ceramics were made to fit the objects, they seemed disjointed with the fuses, glass and metal. It feels like trying to fit mismatched puzzle pieces with a result that is perhaps unappealing, like worn, outdated kitchen wear. I feel that sometimes words like "green", "organic" and "sustainable" are brandished less as method or outlook, and more as a marketing tool or symbol. Sustainability is counter-intuitive when it comes to the challenges we face regarding the environment. Attempting to sustain the current methods and outlooks will lead us to destruction: if we cannot accept change then what else do we deserve. All we produce just becomes a receptacle to the waste of our previous achievements. I was inspired to make a sculpture using the 150+ cans I collected when I worked at the Jazz Festival this past summer. 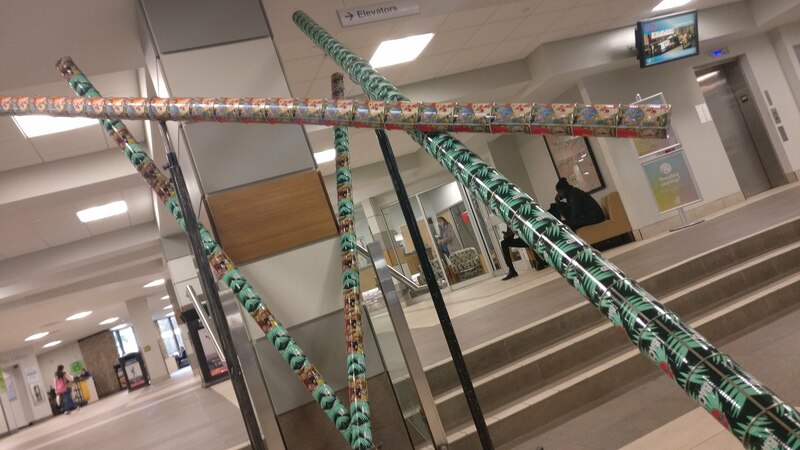 These really long pillars were created by stacking the cans into each other to construct long lines. I welded supports to balance them in diagonal lines. These dynamic, falling lines reflect how we can question the fears, attitudes and rules which have been formed through the environment and our behavior within it. My artwork is an experiment of making a balance between everyday life and how it works its way out as things change unpredictably. The inspiration for my sculpture were the found plastic tubes which I transformed by cutting the long tubes into smaller one-inch circles. 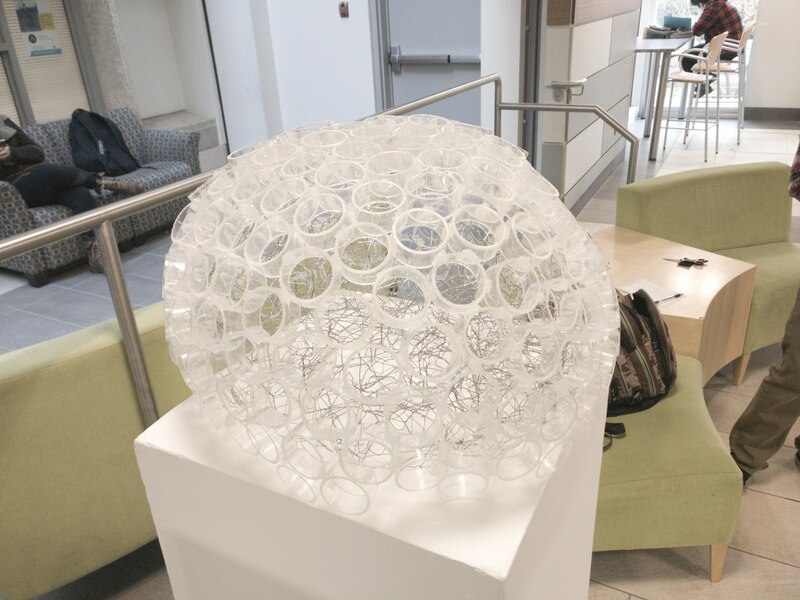 I then made a round shape with chicken wire and glued together the small plastic circles around the wire bundle to create a larger sphere of circles. I was interested in creating an organic form while using an inorganic material by using linear plastic tubes and breaking them down to create a shape that could be found in nature. Originally, I was planning to take the wire out from inside the plastic, but in the end, I really enjoyed the way the irregular metal lines within played against the geometric shapes of the plastic sphere on the outside. 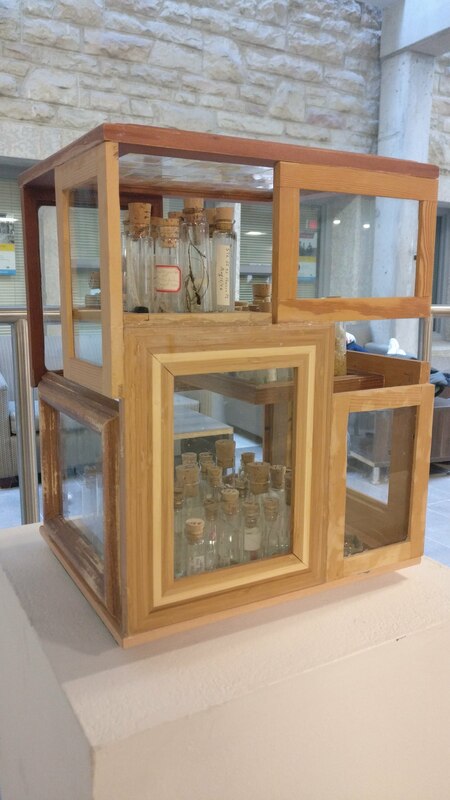 I found a collection of biological sample vials from the 1940s in a cabinet at the campus disposal yard and was inspired to use their scientific significance to explore the idea of collecting: whether it is for research or the objects a person collects throughout a lifetime. Using found frames, I created a cabinet as a safe place to keep my collection. I chose to interrupt the authentic scientific samples with introducing contemporary “samples” from my own home: dish soap, a doll shoe and rubber bands. If someone studies the samples in the cabinet, they might find clues to begin to understand my personal habitat and perhaps question the hierarchies of classification. 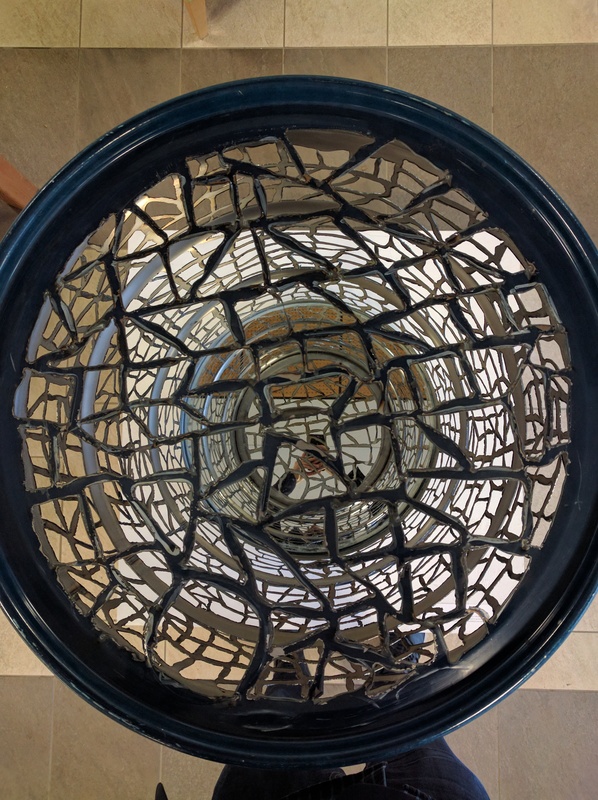 The inspiration for this sculpture was the metal square used to connect the table-top to its base. The triangle and three-quarters circular piece give this piece balance along with the eight concentric three-quarter circles. My objective was to create the feeling of the heat of the Universe; we have the spirit of love within us, let it shine. Using her own large collection of Tim Hortons coffee cups (that she diligently refused to discard), E wanted to transform the paper cup into something not instantly recognizable. In the process of taking them apart E began to enjoy the color variation of the coffee stains and the beauty of the individuality of the objects. 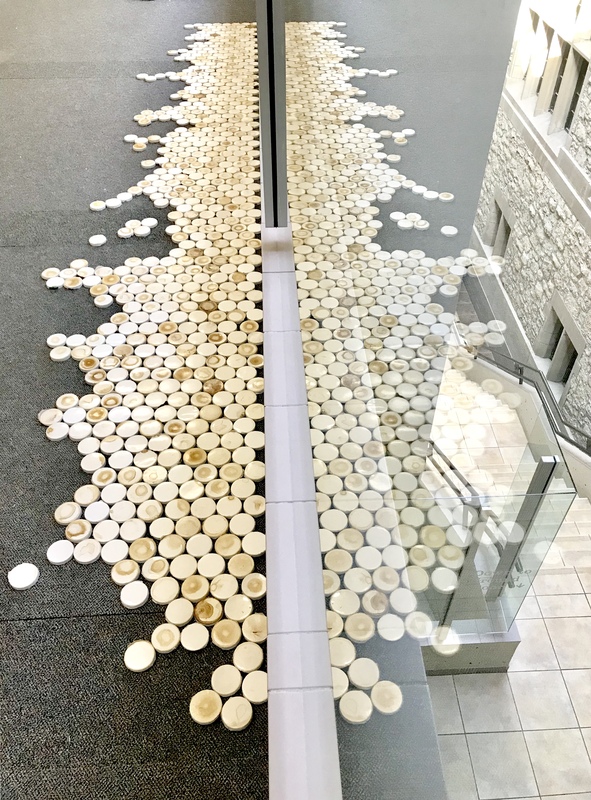 She carefully cut the botoms of the cups and assembled them on the ground, creating a tile-like surface where the stans and variation make the paper cup mysterious, stone-like, and monumental. Only up close might we see the coffee cup material itself. 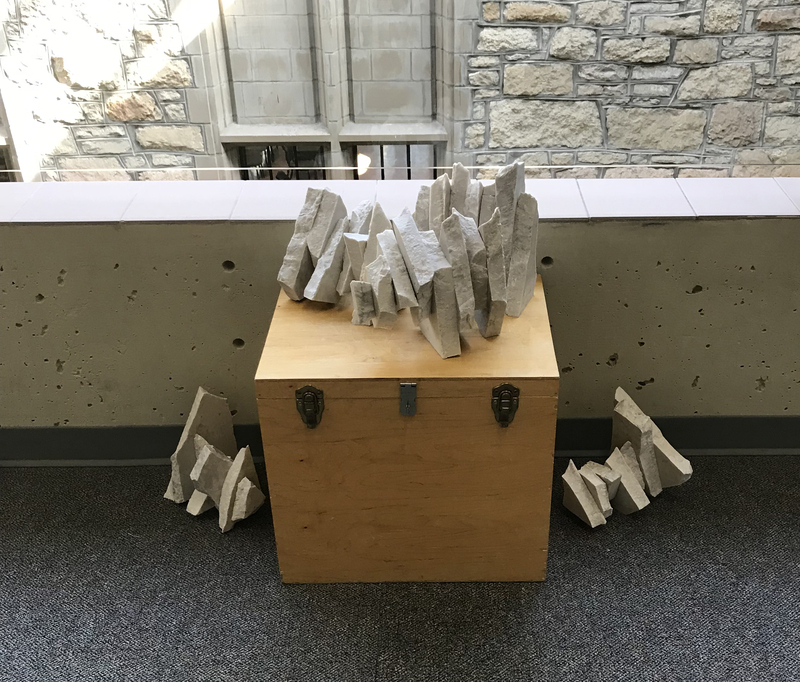 Using the challenge of discarded stone countertops as a media, Gloria responded to the process of breaking it apart, analzing the forms, stacking them, balancing them, setting up contradictory positions, and transforming our perception of how this material should behave. Gloria carefully assembled the stone, referencing cairns, while fixing them to defy gravity and create contradictory associations. 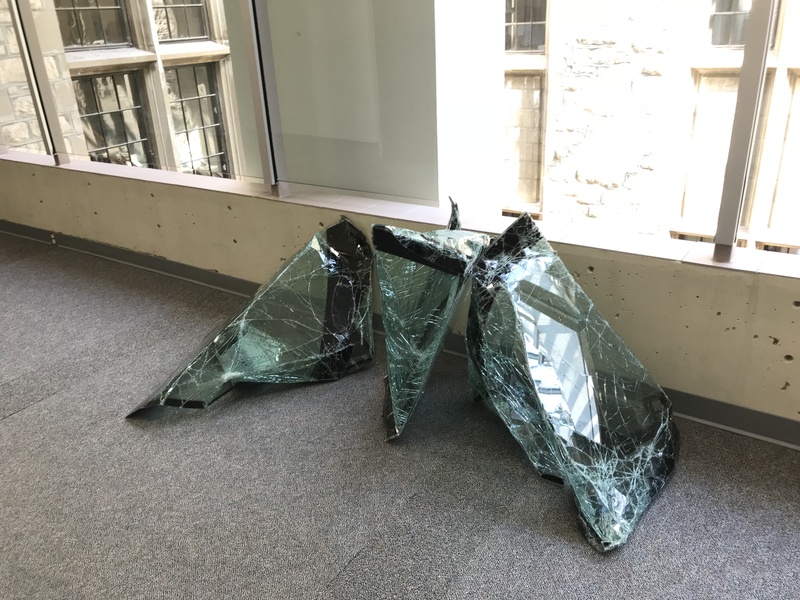 Using the challenge of discarded glass windshields as his media, Geoffrey transformed the glass to become fragmented, broken, and appearing like a smashed car windshield. While this has symbolic associations with cautionary driving, these glass sculptures are also fascinatingly beautiful in color and shape, simultaneously attracting and repelling the viewer. 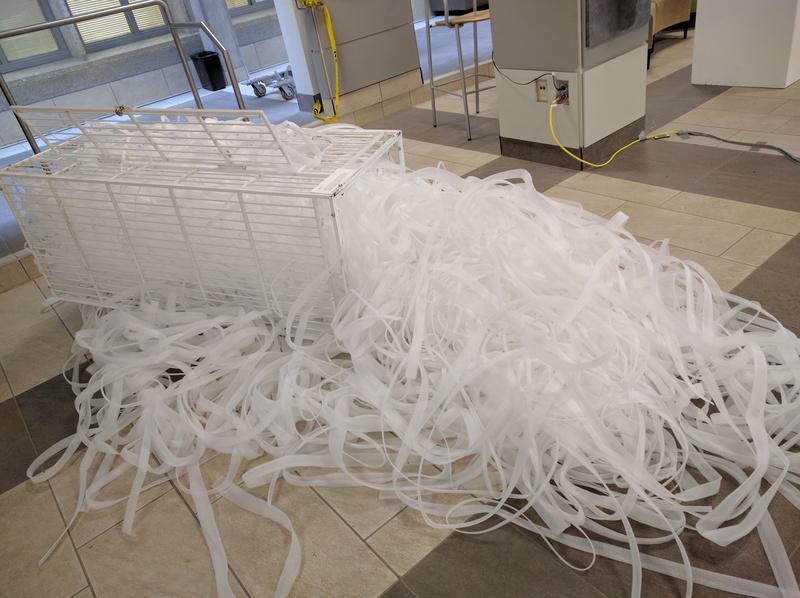 Using discarded sauna tubes, Hailey began by taking the tube completely apart, cutting it into strips, soaking it, reversing the inside to the outside, and exploring what the material would and would not do. 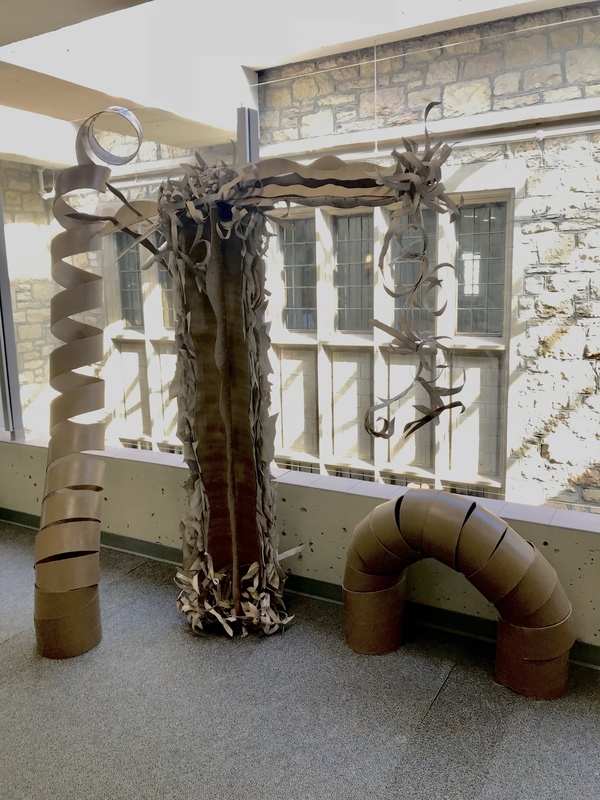 He then began reconstructing an alternative column with organic shapes, parts of the interior now becoming the outside, and strips of heavy cardboard transforming into delicate curled ribbons. The column now is softer, tree-like, and whimsical. 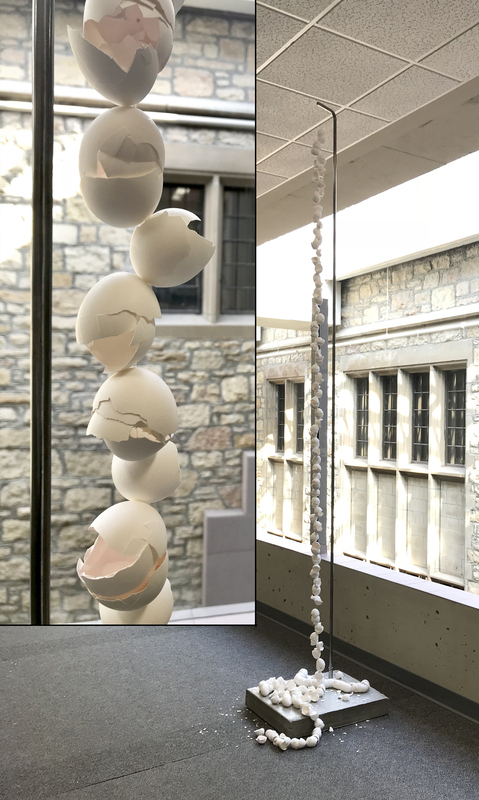 Using the challenge of discarded eggshells as a media for sculpture, Mila transforms the delicate and frail shells into a thin pillar. Stringing them together, they form a line of intricate shapes, exposing both their inner and outer layers, each one unique. They also respond to air flow and move together as a kinetic piece. Using the remnants of a discarded bike, E wanted to use the bike as an artistic tool. Disassembling the bike and reassembling its parts into a rolling machine allowed her to spray oil across a canvas as the new machine was propelled. The leftover oil was recycled and used as automotive oil. Using the remnants of a discarded bike, Gloria was fascinated by the gears, wires, and cables. 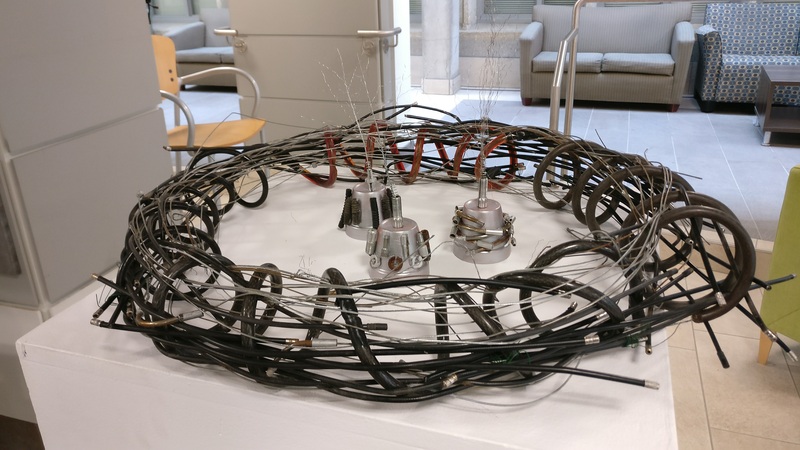 Taking the bike, disassembling it, and salvaging its parts she chose to respond to the cables' and wires' natural tendency of winding and curling, creating a dense nest-like sculpture which imitates how birds collect odd and at times ecletic materials that they are attracted to. 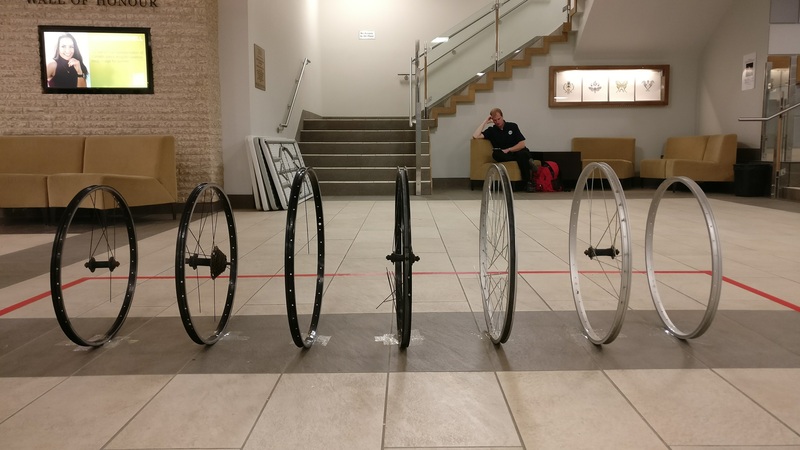 Using discarded bikes and salvaging the bare wheels, Geoffrey was attracted to trying to simulate the movement of a wheel using multiple rims and positioning them as if floating. Geoffrey also removed spokes from all the wheels, and if viewed from one end the bike wheel becomes complete. Using the remnants of a discarded bike, Hailey diligently stripped the rubber from the tires and carefully cut the heavy rubber into strips. He wanted to build an object that was completely unrecognizable from the bike itself and built an anthropomorphic sculpture that is creature-like and uses both the rubber of the tires, cables, and other hidden parts of the bike. Using the remnants of a discarded bike, Mila was attracted to the sounds and visual movement of the wheels and gears. Taking the bike apart and reassembling its parts she created an apparatus that moves awkwardly, swings like a pendulum, and has its activity generated by the viewers' interaction. 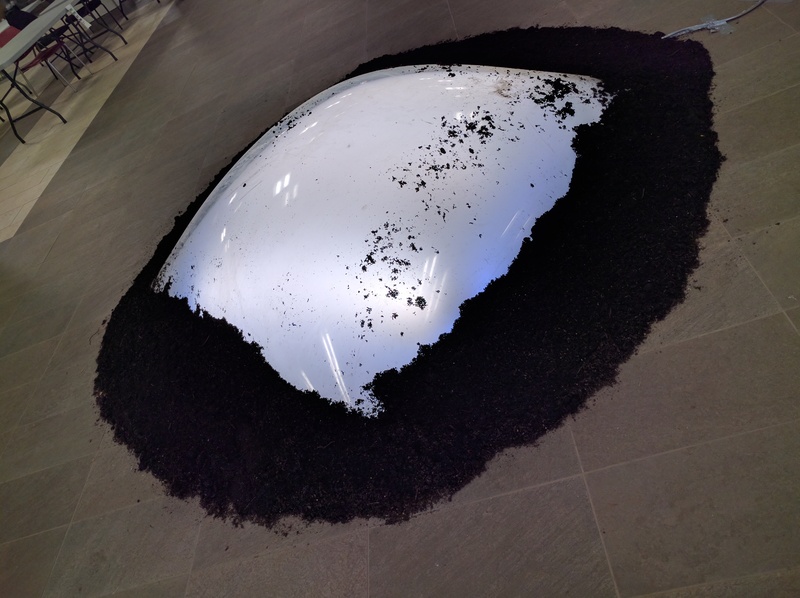 Produced co-operatively by all of the participating ART*Cycled 2016 students, this light dome as modified to feature a rotating palette of coloured lights. 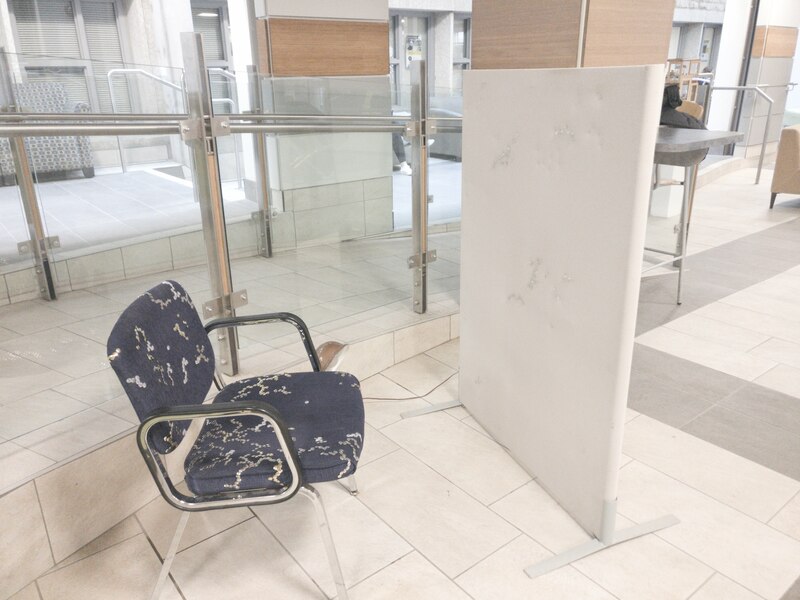 It was surrounded by potting soil in the Place Riel North Concourse to produce a the effect of a glowing orb protruding from the earth. 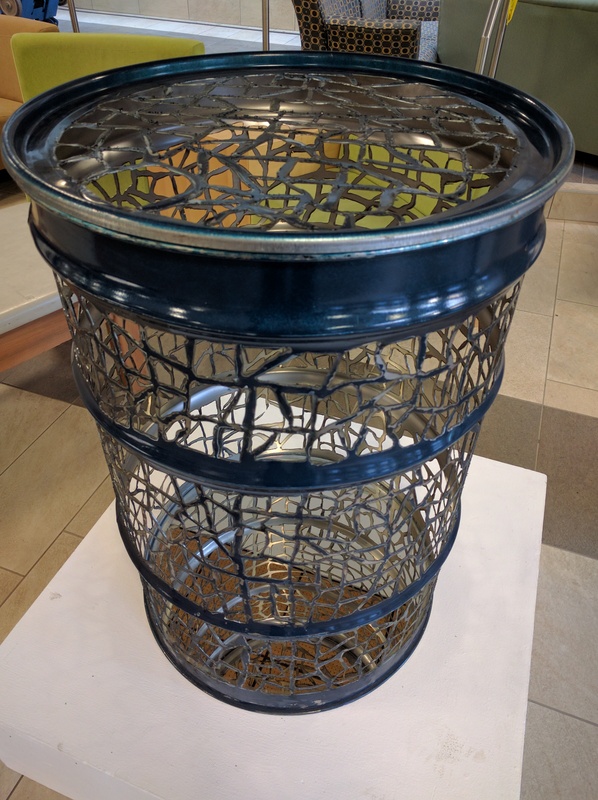 "Inspired by the intricate metal work of artist Cal Lane, I decided to cut organic, skeletal leaf patterns into this barrel using a plasma cutter to open it up and add a visual lightness. In order to add the illusion of depth, I placed a mirror in the bottom and added an inch of water to provide the added illusion of movement." 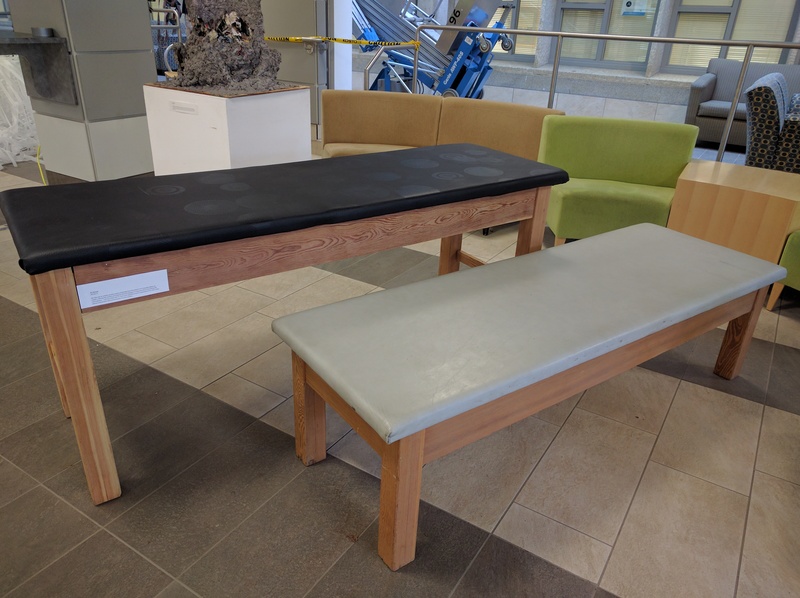 "My idea was to artfully recycle a piece of garbage (two discarded U of S massage tables) by subtly refining the surface and making minimal changes to bring new life to something old and forgotten. I left one table with its used vinyl upholstery and re-upholstered th eother table, adding a dissolvable silkscreened pattern to the surface." 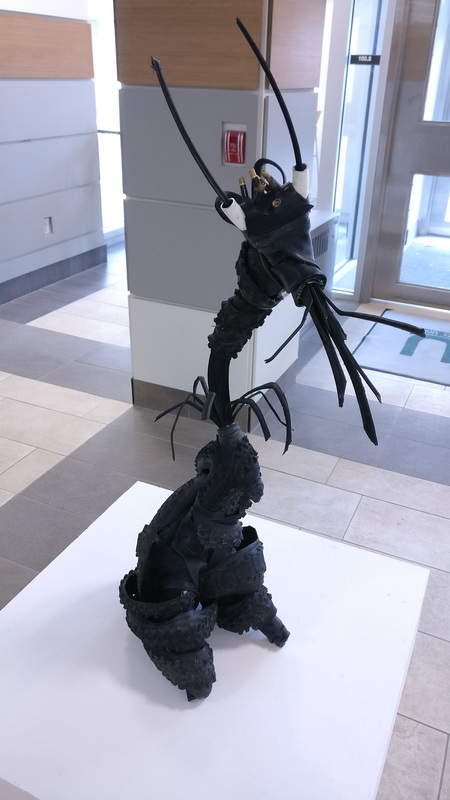 "In my sculpture, Nest, I used a found parrot cage, tipped over and stuffed with synthetic materials that spill out, to signify the unnatural way we claim ownership over other species by locking them in cages and domesticating something that was once wild. Our methods and technologies are wildly out of balance and our need to dominate and control nature has a resulting negative impact. The nest is a bird's traditional home which has been disrupted and infringed upon by our destruction of the environment." 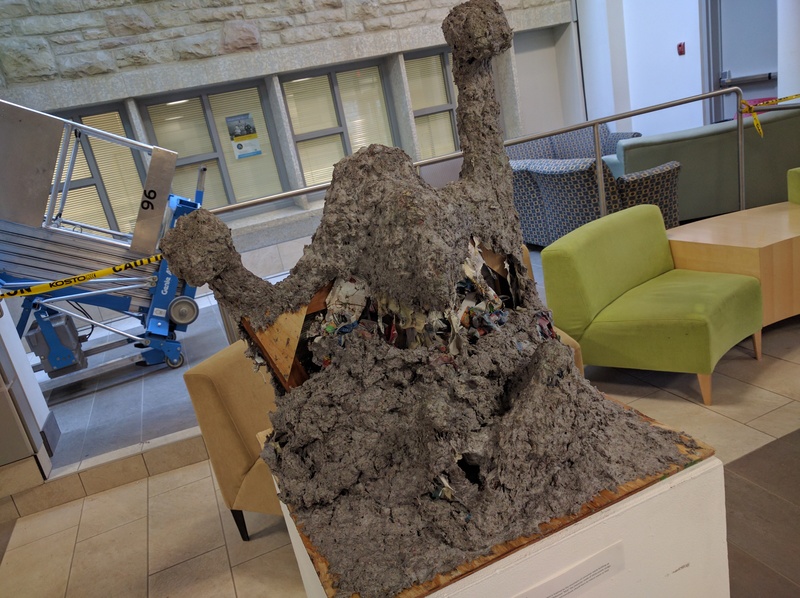 "The idea for my recycled art piece is inspired by the mountains of consumer waste building up in our landfills. I added a touch of the Pokemon character "Muk", made of sticky purple sludge. Consumer waste is becoming a problem and everybody should learn to reduce waste or Muk will get you!" 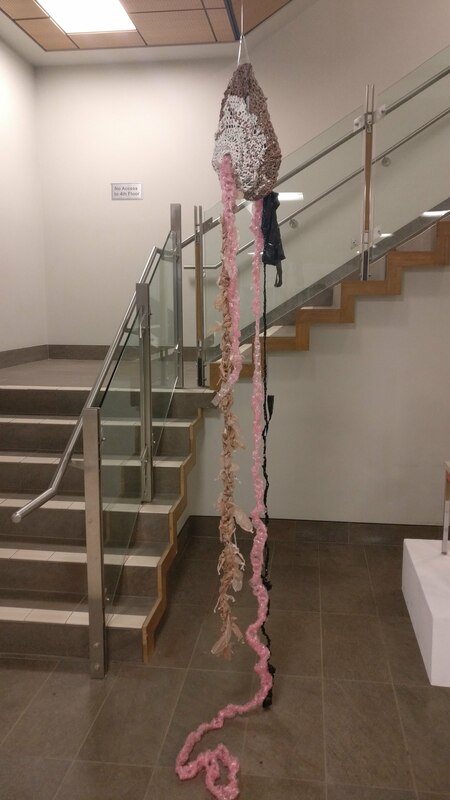 "My art piece, ﻿Instruments of Consumption﻿, was inspired by wanting to recycle my daughter's baby formula bottles. I added recycled wood, metal, plaster, and paint to create a series that represents the exponential consumption of our society." 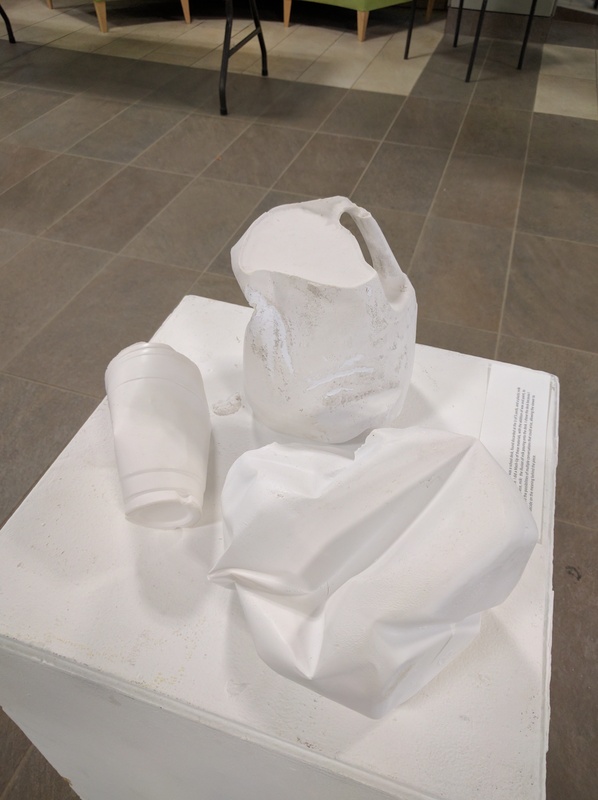 "My recycled material was a school desk, found discarded at the U of S Materials Handling yards, and a plastic milk jug from my home. 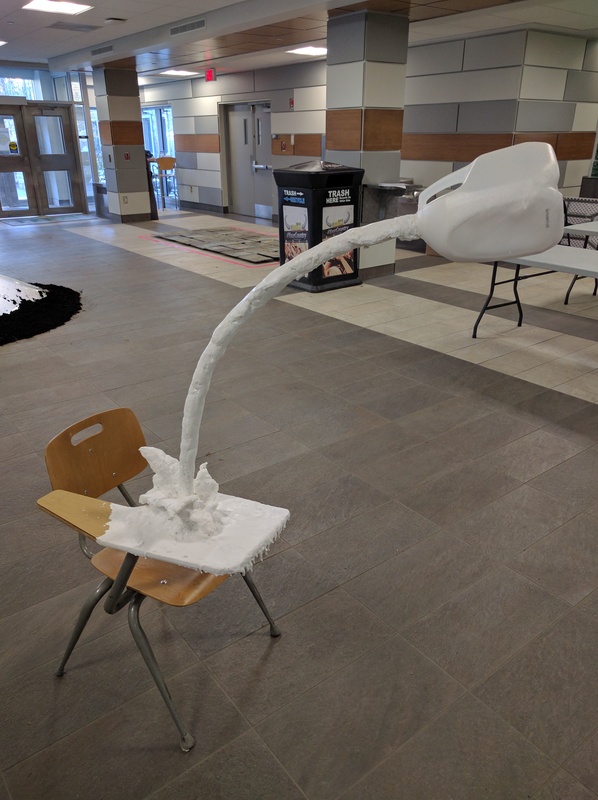 I did a mash-up of these materials with the addition of wax and paint to create my piece, ﻿Milk﻿, which is the illusion of milk pouring onto the desk. I chose the desk because I enjoyed the possibilities of multiple conversations that could arise, allowing the viewer to decide on the meaning behind the piece." 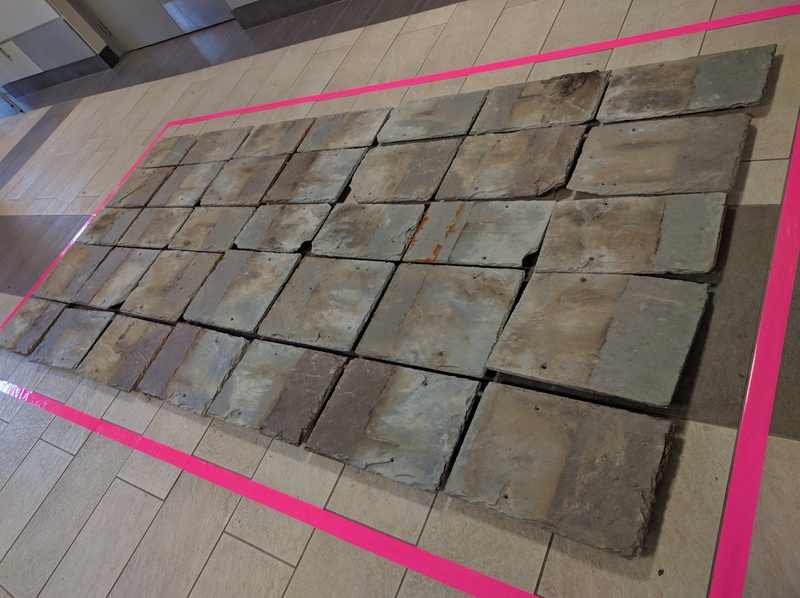 "These slate tiles were once used as shingles on a building at the University of Saskatchewan, but had been replaced and discarded. In light of their disposal, I've collected and arranged these tiles to be admired as documentation of the time they endured."